In fact, he’s the one who came up with the recipe when launching The MAINE three years ago. His idea was to create the ultimate aperitif drink from the simplest, yet finest ingredients. It blends together the sharp taste of Ketel One Vodka originating straight from the Netherlands, with the strong herbal aromas of Carpano Extra Dry, and the sour flavour of a homemade pickled carrot. Our favorite backseat activity… The Backseat Negroni. Consisting of Rye, Lillet Blanc, Aperol, Pechaud Butter, Oranges Bitter, Dehydrated Campari and Absinth. It tastes even better than it looks. Plus, our perfect balance of spirits will make you want to lick the glass, all the way down. Why not something from our new cocktail menu, 'Remember The MAINE'? Most parts Bulleit Rye with a cherry on top, and don't risk pushing through our crowded bar to try one of The MAINE's most classic cocktails. The highly anticipated Dubai Cucumber Day - an annual celebration of the inimitable green fruit and its remarkable virtues will cause consternation in financial markets across Dubai once again. This October, Hendrick’s Gin will recognize the true value of the cucumber by transforming the humble green fruit into exchangeable monetary units in celebration of Cucumber Day on October 10th. Monkey Shoulder, Grapefruit Juice, Orange Marmalade & Mint. Some whiskeys are meant to be mixed. Paired with the right mixes, a classic liquor becomes an instant classic. The citrusy elements blend into the whiskeys flavours to bring out a combination so zesty, yet sweet. The final touch of mint brings a cool note reminiscent of the refreshing escape from the summer heat. Going bananas may be a summer solution, after all. Summer is here and it has rolled around far quicker than we thought possible. With pool and beach days pretty much off the cards and little chance of sitting outside without becoming a puddle, it’s time to move the party indoors. Ideally at The MAINE bar with a cool, refreshing bourbon-based cocktail at hand, say, our Mint Julep? Served over mounds of crushed ice and top with freshly picked garden mint, this is one drink that will keep you cool in this weather. There’s no denying its getting hot. But WWJTD (What would Justin Timberlake do)? Rye Me A River, obviously. Made with Bulleit Rye Whiskey, just like it’s name, we throw in a few cheeky unexpected ingredients such as Absinth 55 and raspberry vinegar that makes this signature cocktail go down as smooth as silk. Considering the conditions, the only solution is to sit pretty and sip slow at our marble bar while the cool air blows inside. Which is why our summery cocktail A Press Gang was born, and at The MAINE you don't need to bother with the heat when our marbled bar is beckoning to sip on one of these. Packed with Spicy Pineapple, Jose Cuervo and topped with fluffy grapefruit, it tastes even better than it looks. Plus, our perfect balance of Campari Salt will make you want to lick the glass, all the way down. A glass of wine a day keeps the cardiologist away, or so they say. That may be the reason there is such a thing as International Wine Day (May 25). Celebrated by cultures around the world for centuries, wine may be one of the most popular drinks in the world. So sit back, relax and enjoy a nice glass of wine from our picks and raise a glass to the French for the hard work they’ve put into making us more lovable. Santé! Long gone are the the "Shaken and Stirred" days for the humble martini. The MAINE has challenged the traditional martini with this recipe for the spicy and briny, Dirty Pickle. Despite its name, this is a really elegant cocktail. We might never know how utterly charming, brilliant and entertaining we are, were it not for martinis. One of these is all right, two maybe too many but three are not enough..
Give something tall, dark, and handsome a try. It is exactly what its name indicates: an "old-fashioned" cocktail, it's strong but not too strong, sweet but not too sweet, and, most importantly, it's dead-simple and absolutely delicious and it is as popular today as it was when bartenders first poured it. The only thing better than a full Old Fashion glass is a recently empty Old Fashion glass. If you love a summery, light, superbly balanced herbal fruit cocktail then this ones for you. This drink is sugar, spice, really good vodka, and everything nice all wrapped up in a pretty cocktail package also a fantastic way to kick off a celebration like, say, the new year? It has a great spice and pear is the primary flavor, throw in a stem ginger and some lime and you have a well-rounded, satisfying cocktail. This cocktail is like no other and can only be found at The MAINE. Get into the holiday spirit, kick back with a twist of your favorite tropical, frothy, boozy cocktail. Our twist on the pina colada has the complexity you have come to expect. This colada is like no other and can only be found at The MAINE. We’re proud of our cocktails. But we’re even more proud of the incredible names we label them with - one of which being the only-slightly Justin Timberlake inspired ‘Rye me a River’, taking centre-stage for October as the elixir of the month. Based on Bulleit Rye whiskey, we throw in a few cheeky, unexpected ingredients such as Absinth 55 and raspberry vinegar to create a concoction that will make your taste buds do a backflip. Not only that, you can stand back and watch your drink being created right in front of you by our alcohol-mixing magicians behind the bar. We’ve come to conclude that summer is trying to kill us, so we’re resorting to fighting fire with fire! No better way to do that than having Tequila in your cocktail, right? Arm yourself with our Tommy’s Burnin, which we took the liberty of putting jalapeño in, for that extra kick. A deliciously dusted rim, a tangy/sweet taste, and that perfect slow burn we've come to perfect, book your table now and don't risk pushing through our crowded bar to try one of The MAINE's most classic cocktails. Sweltering summers tend to leave us with gin fever at The MAINE, so we’ve mapped out a crackin’ menu of top shelf gins, velvety tonics, and delicious garnishes. Considering our condition, the only solution is to sit pretty and sip slow at our long marble bar while the cool air blows inside. We've gone ahead and chosen some of our favorite gins to sample. Gins like The Botanist and Step 5 have us reaching for bright citrus fruits like mandarin oranges and grapefruit, opening our palates and pairing perfectly with herbs like lemongrass and smooth rosemary. Every so-called cocktail lover enjoys a decent Moscow Mule, right? Sure! But we don’t keep things basic at The MAINE, so we made our own concoction for those who do things differently while cherishing the classics. 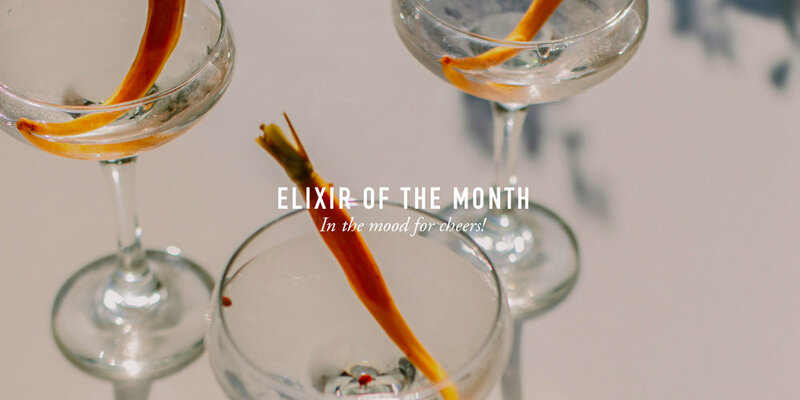 This month’s ELIXIR is none other than the sneaky Dead Man’s Mule; an Absinthe based ‘Anytime’ drink, it’s served in a glimmering rose-gold mug, poured over a mound of cool crushed ice, and topped with a burning cinnamon stick. But the full list of ingredients? Come to Dubai's best cocktail bar to find out why our bar is the only spot you'll need to visit this summer, and drink up a Dead Man's go-to mule. Caffeine rules everything around us. You too? That’s why we’re highlighting our favorite way to consume it this month at The MAINE; black as night, or affogato; decadently poured over a scoop of our vanilla ice cream. Whatever you choose, just get your fix from us. A recurring theme at The MAINE is poppin’ bottles, and bubbly is undoubtedly our go-to when it comes time for something fizzy, crisp and cool. We've introduced a host of new champagnes to the menu - Gosset Grand, Bruno Paillard Blanc de Blanc and Jacquesson Cuvee and the best part, there's no bottle over AED 1,000. Reserve your table and icy cold bottle before the other lovers of bubbly do. It's all about Gin, and why wouldn’t it be? The international bar scene is exploding with new Gin spots and cocktail recipes, and our bar has the list to back it up. As if you didn't need any more reasons to drink the strong and layered flavours of the illustrious spirit we’ve all come to love, we break down why our menu is ideal. If you hadn't had a taste of these gems, you can book your table sooner than later here. The MAINE is paying homage to the roaring 50’s with a retro Italian cocktail that is due for a major comeback! The post brunch setting is ideal for this 2 for 1 promotion on Aperol Spritz every Friday from 4pm till 7pm. Named after the Famous actor from the Wonder Years, this refreshing cocktail is for those early 90's babies. Delicious as a show that defined a generation, you'll want to sip on one of these all night long. The Fred Savage is a combination of Tanqueray Gin, Grapefruit Vinegar, Red Cherry Jam, Dry Vermouth, and Ginger. Tangy and sweet, your taste buds are in for one hell of a ride. We’re so bloody excited about our brand New Cocktail Menu, we can’t wait to share it with you. This section dives deep into the ingredients that go into our libations. First up - the Bloody Shell is our Canadian twist on the Bloody Mary. The Bloody Caesar is like the Bloody Mary’s foreign cousin from up north - similar DNA but a touch more exotic. That’s due to the added touch of velvety clamato juice, spices, and clam broth. Yet we felt we needed to step it up even further, creating our very own classic, The Bloody Shell.